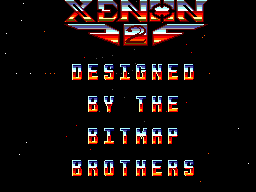 Xenon 2:Megablast is a conversion of the coin-op for the master system.It is one of the many games designed by The Bitmap Brothers; well known for games such as Speedball and Gods.This version was published by Mirrorsoft Ltd. in 1991. 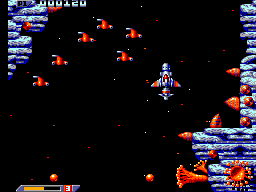 There are six levels to this frantic shoot-em up, each involving battling your way to then end of the level and beating the boss there in order to continue to the next level, much like R-type. The Player's ship has a shield to protect it, however contact with just about anything drains this shield. 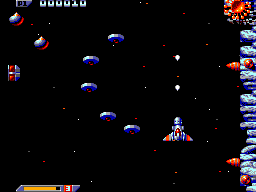 There are many different kinds of Enemies for the player to deal with such as plant-like tentacles on the sides of the screen and and flying-saucer-like objects. As game-play continues you can pick-up various upgrades for your ship which helps you survive the wave after wave of enemy vessels. However i believe the game-play is too slow for a shoot'em up, as the screen scrolls too slowly. The players ship and the surroundings are detailed enough, definitely giving the impression you are flying through a narrow passageway or a wide open space. There is a bit of a slowdown when three or more enemies are on the screen at once. The more enemy's on screen the worse the slowdown. The slowdown also affects controller responsiveness, Which in turn, affects playability. The Music & Sound effects are brilliant, as they blend together perfectly making a great audio experience, providing a beat which does not suit the games speed. However, Great Music and sound effects cannot replace good game-play. The Controls are simple for this game: D-PAD to move in the desired direction and buttons 1 and 2 are for shooting. The Player can fire continuously which is a good feature but adds to the system slowdown. Controller responsiveness varies with how many enemies are on the screen at once. As most arcade games are, it is addictive and has drawn me back to play it despite its glaring flaws. The game-play its self is challenging, with enemies coming form ahead and from the sides of you. It requires you to react quickly, and if you lose the game you think of were you went wrong and what you should have done. Then you start another game and try out your new theory. The Controls are simple, the Game-play is addictive and challenging and will keep you awake...The sounds and music blend together perfectly..but the game really pushes the master systems limits. I recommend this game to people who like a challenge.